Garscube Harriers boasts a long and proud tradition dating back to 1898. The club was formed by W A McCaa at the end of the 19th Century to cater for the growing popularity in running at the time. Despite only having a dozen or so members, the club continued to showed promise in cross country races and began to grow as a result. Much is owed to Mr McCaa and the club still run a cross country race in his honour. In the intervening years, the clubs fortunes have ebbed and flowed. The early part of the 20th Century saw continued running success which was interrupted only by two world wars. The Great War saw many members fighting for King and Country with no activities taking place from 1914 to 1919. The Second World War was less disruptive, the main concession being that night time runs were suspended during blackout periods. From a running point of view, the 1950’s were a transitional phase in the club’s history. Up to this point Garscube had been very prominent in road and cross country running with a few successes on the track. This era produced a mixture of fortunes for the club with a decline in the success on the country and an increase in track achievements. Indeed, by the end of the 1950’s, Garsube’s record of successful cross country racing largely disappeared – not returning again until the early 1960’s. The late 1950’s and 1960’s also saw the emergence of one of Garscube’s most well know alumni – William “Ming” Campbell. Ming had produced some fine performances while competing for Glasgow University and as a member of Garscube, he represented Scotland at the 1966 Empire Games in Kingston, Jamaica running in the 100 yards and 220 yards. He also competed for Great Britain at the European Games running in the 100 metres, 200 metres and 4 x 100m relay. Les Piggot also had some fine performances running the same time as Ming Campbell for the 60 yards indoors and representing both Scotland and Great Britain in track Internationals. With few successes in cross country, the 1970’s saw continued success on both track and road. The Commonwealth Games of 1974 were held in Christchurch, New Zealand with Les Piggot again representing Scotland. Running in the 100 metres Les again got to the final. Elsewhere in the club Kenny Macanna, running for Glasgow University, won the Scottish Universities 400 metres title. During the period 1978 to 1987 the club went through a very bad patch. Turnout for club training nights got so bad that on some evenings only one or two people would make an appearance. The turn out for races was only marginally better. There were some notable successes though. On the roads in 1981 Davie Geddes at last broke the club Marathon record which had stood since 1953. At the first Glasgow International Marathon Davie ran 2hrs 27mins and 27secs. Not to be out done Davie Kerr won the Scottish Vets Marathon that year in a time of 2hrs 37mins and 55secs. As the 1980’s came to a close Garscube started to pick up again. Thanks to the Marathon boom of the late 1980’s membership increased dramatically. In particular, the junior section improved enormously and almost dominated the Colts and Junior Boy age groups at the Dunbartonshire Cross Country Relays and Individual Championships. In subsequent decades, the club has gone from strength-to-strength – both in terms of membership numbers and performances. With the emphasis firmly on cross country and road running, members regularly compete at events throughout the world with both junior and senior athletes representing Great Britain. Here is W. A. McCaa who was Club President from 1898 to 1902. 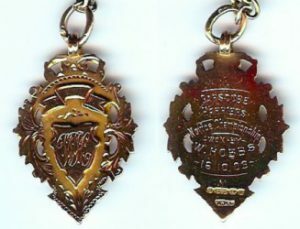 Also shown is the 8 miles handicap second place prize medal, which was won by James Weir on 18/03/1899. At the end of the 19th century many athletics clubs flourished in the north of Glasgow including Springburn Harriers, Clydesdale Harriers and Partick Harriers. Sadly Partick Harriers no longer exist but Springburn Harriers and Clydesdale Harriers are still a force in Scottish Athletics. Mr W. A. McCaa, from the TEMPLE area of Glasgow, thought that a HARRIERS club should be founded to cater for the people in the area. Thus Garscube Harriers was founded in October 1898. W. A. McCaa was elected as the first club president and Mr James Orr was the first club secretary. In the early days Garscube struggled to gain any recognition, mostly due to a very small membership, which was originally only about 12 to 18 members. But under the guidance of W. A. McCaa the club began to grow. By the turn of the century Garscube Harriers had increased its membership, and some fine performances in Cross Country races were produced. The only achievement of note during this period was that Garscube again won the Clydesdale Harriers Open Team Race in 1913 and 1914. With so many of the club members off fighting for King and Country in the Great War no club activities took place from 1914 to 1919. The image above is of the Novice Championship from 1909. 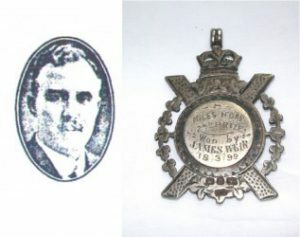 The medal was won by William Hobbs. His daughter Abigail Halbert was good enough to show me the medal and her son Gavin has sent me these pictures. This was one of Garscube’s finest eras with the club claiming many honours. In 1921 the club won the West District Cross Country team title, Johnny Cuthbert won the Scottish 10 mile championship and Garscube finished second team in the Scottish Cross Country Championships. After finishing third in the Scottish Cross Country Championships, A. B. Lawrie was selected to represent Scotland at the World Cross Country Championships but unfortunately failed to finish the race. In 1922 the club again achieved National honours finishing third team in the Scottish Cross Country Championships and first team in the Scottish Novice Cross Country Championships. Johnny Cuthbert was selected for the Scottish Team in the World Cross Country Championships and finished in 21st place. In 1923 Johnny Cuthbert emigrated to Canada but continued his running career. He won the Canadian Olympic Marathon trial and was selected to represent Canada at the 1924 Olympics in Paris running in the Marathon and the 10000 metres. During his spell in Canada he won the Canadian 10000 metres, 10 miles, 12 miles and Marathon championships, setting records at these distances. In 1923 Garscube continued their great feats in Cross Country. Again they finished first team in the West District Cross Country Championships and the Clydesdale Harriers Open Team race and second team in the Scottish Cross Country Championships. Again two members of Garscube, A. B. Lawrie and Joe McIntyre, were selected to represent Scotland in the World Cross Country Championships finishing in 30th and 32nd place respectively. The club repeated the second team place in the 1924 Scottish Cross Country Championships and also finished first team in the Scottish Novice Cross Country Championships. Joe McIntyre was again selected for the Scottish team in the World Cross Country Championships but unfortunately he failed to finish. Garscube’s finest moment arrived in 1925. They won the first running of the West District Cross Country Relay Championships to receive the new trophy, the Struthers Shield. But the year was capped by a fine team performance when Garscube finished first team in the Scottish Cross Country Championships. A. J. McMorran lead the team home in fourth place and Garscubes first 4 runners all finishing in the first 9 places. This fine team performance again saw 2 Garscube men running for Scotland in the World Cross Country Championships. A. J. McMorran finished in 27th place and Joe McIntyre 36th. This fine team performance was repeated in 1926 when the club again finished first team in the Scottish Cross Country Championships. Dan Quinn was selected for the Scotland team in the World Cross Country Championships were he finished 21st. Although the club did not record any team honours in 1927, 3 members of the club were selected for the Scotland team in the World Cross Country Championships. Johnny Girvin finished 31st, A. J. McMorran was 32nd and R. Roxburgh was 38th. To begin this new era in the history of Garscube Harriers on Saturday 15th of September 1928 the club moved to new premises at Westerton. This period was a remarkable time for one club member in particular. Robert Sutherland was an Anglo Scot who also ran for Birchfield Harriers in England, winning many English team honours with them. In the 10 year period 1928 to 1937 he represented Scotland on seven occasions in the World Cross Country Championships. During this period the Garscube again achieved many team honours. In 1928 Garscube finished third team in the Scottish Cross Country Championships. Robert Sutherland, running as an individual, finished fourth to take the Junior title. In the World Cross Country Championships Robert Sutherland finished 18th. 1930 saw the Garscube again win the team title at the Scottish Novice Cross Country Championships. Robert Sutherland finished second in the Scottish Cross Country Championships and once more selected to represent Scotland in the World Cross Country Championships. This time he produced a fine performance and finished in second position. Meanwhile on the other side of the Atlantic Johnny Cuthbert again represented Canada, this time in the Empire Games in Hamilton (Canada), running in the 10000 metres and the Marathon. Not to be outdone Robert Sutherland, after winning the Scottish 4 mile track championship, also competed at these games for Scotland where he finished 4th in the 3 mile track race. Garscube picked up a few more team honours in 1935, winning the Midland District Cross Country team title and also Victoria Park’s McAndrew road relay and finally took the third team place in the Scottish Cross Country Championships. The 1936 World Cross Country Championships again saw Robert Sutherland competing in the Scotland team where he finished in 13th place. Robert Sutherland’s final appearance in the World Cross Country Championships was in 1937 where he was placed 20th. In all of his appearances in the World Cross Country Championships Robert Sutherland was always one of the counting members of the Scotland team helping them to two second places, four third places and finally fourth place in his last appearance. Alongside his achievements on the Country Robert Sutherland finished his career by winning the Scottish 2 mile Steeplechase championships. Cross Country Union Centenary book he was a member of the English club Darlington Harriers. He also won the Scottish Steeplechase in 1936 and the English Steeplechase in 1937. Robert Sutherland was again the star runner for Garscube in 1931. He repeated his runners up place in the Scottish Cross Country Championships helping the Garscube team to take second place in the team competition. Running in the World Cross Country Championships for Scotland he finished in 8th place. A young upcoming runner for the club this year was Donald Urquhart who won the Midland District Cross Country Championships leading the Garscube team to third place. Although Robert Sutherland again placed second in the Scottish Cross Country Championships in 1932, due to his Army commitments he was unable to participate in the World Cross Country Championships. However the Garscube once more had a representative in the race. Following the previous years promise Donald Urquhart made the Scotland team and finished in 20th position. Robert Sutherland continued his fine racing form in 1933, placing 4th in the Scottish Cross Country Championships. Along with Johnny Girvin, Robert Sutherland again competed in the World Cross Country Championships. Running a strong race he once again gained the Silver Medal by finishing second and Johnny finished in 44th place. Robert Sutherland competed in the 1934 World Cross Country Championships were he finished 11th. This period of the club’s history was again interrupted by war. The Second World War from 1939 to 1945 didn’t cause as much of a disruption to the Garscube as the Great War had done. The club continued to function during this period with the only major outcome being that night time runs were suspended during the blackout period as the committee felt it would be dangerous. Also the 1939 – 40 and 1940 – 41 club Cross Country Championships were run as ROAD races. Unlike the previous decade where Garscube had supplied several athletes for the Scotland team in the World Cross Country Championships not one member of the club was selected between 1938 and 1950. However in 1938 the younger members of the club were doing well by winning the team competition at the Scottish Cross Country Championships. During the Second World War races continued to be promoted throughout Scotland and Garscube performed reasonably well. 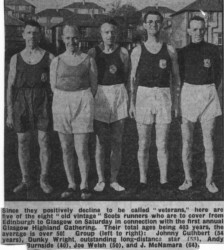 In 1941 they again won the Victoria Park McAndrew Road Relay and also won the Dundee ‘Kingsway’ Relay. In 1943Garscube finished first team in Maryhill Harriers Nigel Barge Road Race and also won the Around Dundee Relay Race. At the 1947 Scottish Novice Cross Country Championships Joe Duffy ran a fine race to take the title. This year there was also some rare track success for Garscube when they won the Exhibition Trophy at the Babcock and Wilcox Sports. Finally, Robert Smith won the Scottish Junior Mile championships. On this page you can see a picture from the 1947 Milngavie Games. This era would appear to be a transitional phase in the club’s history. Up to this point Garscube had been very prominent in road and cross country running with a few successes on the Track. But this era produced a mixture of fortunes for the club with a decline in the success on the country and an increase in track achievements. Individual glory was achieved by Alex Kidd and Gordon Dunn. Both runners represented Scotland at the World Cross Country Championships. Alex ran in the 1951 race where he finished 55th and Gordon ran in 1956 and finished in 60th position. In 1948 Garscube performed well on the country winning the team competitions in both the Dunbartonshire and Midland District Cross Country Championships as well as the Youth’s team at the Dunbartonshire. They also took the third team medal at the Scottish Cross Country Championships. To date this was the last National championship success Garscube have achieved at senior level. Garscube repeated their Dunbartonshire Cross Country Team success in both the Senior and Youth age groups in 1949. 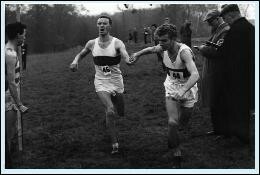 The Dunbartonshire Senior Cross Country Championships remained with Garscube in 1950, 1951, 1952, 1953, 1954 and 1955. The Dunbartonshire Cross Country Relay title was also captured again in 1950, 1952, 1953, 1954 and 1956. The youths also took the team title again in 1953. The club’s up turn in track success lead to Garscube again winning the Exhibition Trophy at the Babcock and Wilcox Sports in 1949, 1951 and 1952. At the Glasgow Highland Gathering the club also won the Lumley Shield in 1949 and 1952 for the relay race. Individually Donnie MacDonald represented Scotland on the track in 1952 and 1954. With the 1950’s drawing to a close, so too was Garscube’s record of successful cross country running. 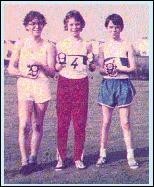 In 1958 the club’s youths gained first team place in both the Dunbartonshire Cross Country Relay and the Dunbartonshire Cross Country Championships. Further cross country success did not come Garscube’s way until 1963 when the 1963 Dunbartonshire Relay Championships which the senior team won. The final success on the country in this period was on the individual front when in 1966 Jim Cook won the Midland District and Scottish Youths Cross Country Championships. These runs gained Jim selection for the Scottish Junior team at the World Cross Country Championships were he finished 27th. At this time Garscube began to produce some fine track performances. Donnie McDonald continued his earlier success by winning the 1958 Scottish 880 yards title. This achievement led to Donnie being selected for the Scottish team running in the 880 yards and 4×440 yards relay in Empire Games in Cardiff. In 1961 and 1962 Ian Tainsh won the Scottish Junior Triple Jump Championships. In 1964 Les Piggot competed for Scotland on the track and equalled the Scottish 100 yards record with a time of 9.8 seconds. 1965 saw Les again compete on the track for both Scotland and Great Britain. In the younger age groups G. Hamilton won the Scottish Youths High Jump title. In 1966 another sprint star came to Garscube. In the late 1950’s and early 1960’s William ‘Ming’ Campbell had produced some fine performances while competing for Glasgow University. Now a member of Garscube Ming represented Scotland at the 1966 Empire Games in Kingston, Jamaica running in the 100 yds and 220 yds. He also competed for Great Britain at the European Games running in the 100m, 200m and 4×100m relay. Running indoors Ming equalled the UK National Record for 60 yds with a time of 6.2 seconds. Les Piggot also had some fine performances this year running the same time as Ming Campbell for the 60 yds indoors and representing both Scotland and Great Britain in track Internationals. Team wise the club also won the Scottish 4×110 yds relay title and the Louge Trophy as the most successful club at the Dunbartonshire Track Championships. To close this era 1967 was another year of success for Ming Campbell and Les Piggot. Ming Campbell gained the British 220 yards title and Les Piggot broke the Scottish 100 record with a time of 9.7 seconds. 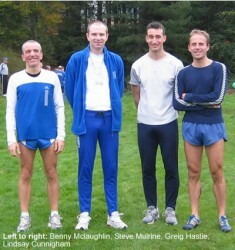 Again Les was honoured by running for both Scotland and Great Britain on the track. The Garscube team again performed well winning the West District 4×110 yds relay title, winning the Exhibition Trophy at the Babcock and Wilcox Sports and retaining the Louge Trophy at the Dunbartonshire Track Championships. The only real success on the country during this time was achieved by the youngsters or the veterans of the club. In 1968 Jim Cook repeated his success of 2 years earlier and ran for Scotland in the World Cross Country Championships were he finished in 18th place. 1972 saw the Junior Boys team of Ronnie Weir, Jim McAnney and Neil McDonald gain the Dunbartonshire Cross Country Relay Title. Ronnie also won the fast time prize that day. The final Cross Country success went to Walter Ross who gained the Scottish Over 50’s title in 1973. In the early 1970’s Tommy Wiseman also performed at the highest level on both the Road and Cross Country. Yet again on the track it was Ming Campbell and Les Piggot who kept the Garscube name up in lights. In 1968 Ming broke Les Piggot’s 100 yds record with a time of 9.6 seconds. Not to be out done Les made the Great Britain team for the Olympics in Mexico City. The Garscube sprint relay team again did well winning the Scottish 4×110 yds relay title. The Logue Trophy for the most successful team at the Dunbartonshire Track Championships remained Garscube’s property in 1968, 1969, 1970, 1971 and 1972. Individual success in 1969 was limited to H. Gillespie winning the Scottish Youths 100m title. Les Piggot got 1970 off to a great start by winning the Scottish 100m title. This gained him selection for the Scottish team at the Commonwealth Games in Edinburgh where he reached the final of the 100m. As in 1969 Garscube produced the Scottish Youths 100m champion. This time it was won by Russel Dunlop. The 1971 Scottish track championships saw Garscube pick up three titles. Les Piggot repeated his previous year’s success in the Senior 100m. Ian Murray took the Youths 400m title and Alastair McLachlan won the Boys 400m title. Once more Les represented both Scotland and Great Britain on the track. In 1972 Les moved up a distance and won the Scottish 200m title. He was again selected for the Great Britain team for the Olympics in Munich. Les compeated in the 100m were he got to the Semi Finals. Les continued his tradition of competing for Great Britain in 1973. The Commonwealth Games of 1974 were held in Christchurch, New Zealand with Les Piggot again representing Scotland. Running in the 100m Les again got to the Final. Elsewhere in the club Kenny Macanna, running for Glasgow University, won the Scottish Universities 400m title. On the track in 1975 the club performed really well and gained promotion to Division 1 of the Scottish Athletics League. At the Glasgow Highland Games Garscube had entered two teams into the Scottish 1600m Medley Relay. Things didn’t quite go to plan though and a mix up at the first change over saw the Garscube B team taking a commanding lead which they never lost. Fortunately the A team rallied well to finish in second place. Unfortunately some poor performances in the Scottish League saw the club finish last in 1976 which meant that they would be back in division 2 again in 1977. At the Scottish championships Les Piggot once more captured the 100m title and Derek Leitch finish second, first Scotsman, in the 800m. This run gained Derek two international competitions for Scotland. At the relay championships Garscube again won the 1600m Medley Relay and gained third place in the 4×400m. Things did not improve in 1977 with the club struggling to survive in Division 2 of the Scottish Athletics League. During the period 1978 to 1987 the club went through a very bad patch. Turnout for club training nights got so bad that on some evenings only one or two people would make an appearance. The turn out for races was only marginally better. By the mid 1980’s the Clubhouse at Westerton was almost unusable and the club resorted to using Blairdardie all the year round. Despite the apparent DOOM and GLOOM the club still managed to maintain some form of success. Admittedly the level of success was not quite up to the previous high standards of the club but it did silence some outside critics who would always ask the club members at races Garscube I thought Garscube had folded. 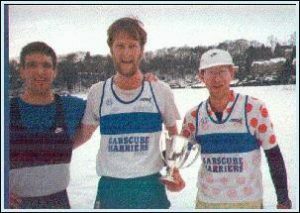 Individually, Ian Murray won the Dunbartonshire 100m in 1981 and 1982, the 200m in 1981, The West Districts 200m in 1982. Also at the 1981 Dunbartonshire Championships Kenny Macanna was second in the 400m with Denis O’Reilly 3rd, Billy Cassidy was 3rd in the 800m and Stephen Cullen was second in the 3000m Steeplechase. In 1982 Stephen Cullen won both the Dunbartonshire and West District 3000m Steeplechases. During the 80’s the club still managed to pick up various relay trophies from the Highland Games circuit. On the roads in 1981 Davie Geddes at last broke the club Marathon record which had stood since 1953. At the first Glasgow International Marathon Davie ran 2hrs 27mins and 27secs. The following week he travelled up to Dingwall and ran the Black Isle Marathon which he won in a time of 2hrs 29mins and 58secs. Not to be out done Davie Kerr won the Scottish Vets Marathon that year in a time of 2hrs 37mins and 55secs. As the 80’s came to a close Garscube started to pick up again. Thanks to the Marathon boom of the late 1980’s membership increased dramatically. Over the last 4 to 5 years the Junior section improved enormously thanks to the hard work of Stephen Sheridan. This saw the kids almost dominate the Colts and Junior Boy age groups at the Dunbartonshire Cross Country Relays and Individual Championships. Some great performances in track and field saw Leonna Canning being ranked number 1 several times for the Under 17 girls Triple Jump, Richard Blair won Scottish, West District and Dunbartonshire titles both indoors and out for the Long Jump, Triple Jump and High Jump. The performances of the youngsters meant that Garscube Harriers looked forward with confidence to the next 100 years. Stephen Mulrine was timed at 14:32 on the opening leg of the Men’s 4×2.5 miles relay handing over in 5thplace to Lindsay Cunningham who gained two places to finish in 14:24 . Greg Hastie pulled back a further place in the 3rd leg in 13:56 and Benny McLaughlin anchored the Team to victory on the last leg in 14:25 , winning the medal for fastest Veteran in the process, to produce a total time of57:17 .